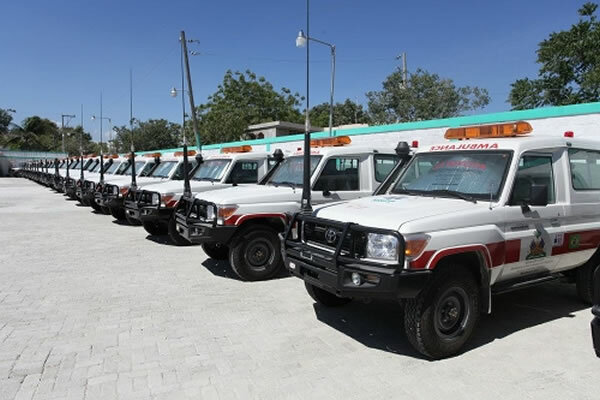 On Monday, December 15, 2014, the US Agency for International Development (USAID) donated 10 ambulances to the Ambulance National Center (CAN) to strengthen its North-East network and open the South. The delivery ceremony was attended by the First Lady Sophia Martelly in the presence of Dr. Florence Duperval Guillaume, the interim Priminister of Haiti (then she was the Minister of Health), Dr. Rajiv Shav, General Administrator of USAID, and other financial and technical personalities from the ministry. According to Dr. Shah, about 70% of the Haitian women give birth at home due to the lack of emergency medical services. He expressed his belief that these ambulances will improve the emergency health care system in Haiti provided it is supplemented by government support programs. The First Lady conveyed her solidarity with the emergency health care management program.